Close-up of the Nolah mattress stretch cover. The Nolah mattress is delivered to your doorstep in a small box. Nolah touts its mattresses for their pressure relieving qualities. How does the Nolah Original 10" perform in our tests for spinal alignment and pressure relief? Nolah touts its mattresses for their pressure relieving qualities. How does the Nolah Signature 12" perform in our tests for spinal alignment and pressure relief? The Nolah mattress is made without the use of heat-trapping Viscoelastic chemicals as found in all Memory Foam. Nolah mattresses are guaranteed to sleep cooler than any Memory Foam mattress and have been proven to offer 4x times less peak pressure on the sleeper's hip and back area, while also being 300% more durable than high-end Memory Foam and Latex. 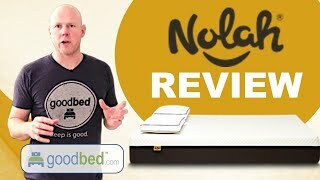 To decide whether a Nolah mattress is the right choice for you, read GoodBed's expert review of the Nolah Signature 12 mattress and Nolah Original 10 review, or watch our in-depth video review of the Nolah mattresses. Is Nolah the right bed for you? Nolah mattresses are recommended by 66% of owners on GoodBed (based on 56 ratings + 4 reviews). Do you have something to say about your Nolah mattress? Write a Review! Support Layer Details: So strong that we warrant it for life! It's 8" of ultra-grade core foundation foam. Nolah's Signature core foam is stronger and reinforced to endure even the most extreme conditions. Mattress Thickness: 10" to 12"
Note: The product line specifications above were derived from the active Nolah models listed on GoodBed. As a result, these details may not be comprehensive and may not apply to all Nolah models. If you are seeking specifications for a particular Nolah mattress, please search for that mattress by name on GoodBed, or check with your local Nolah dealer. Which mattress from Nolah is best for you? Before shopping at Nolah, take a short quiz to find which of their mattresses best matches your unique needs and preferences. Powered by GoodBed’s intelligent matching technology, you can even get your personal match score for each of Nolah's available mattresses, in addition to other online options that match your criteria. Nolah is a mattress manufacturer founded in 2016 that is based in Denver, CO.
Have an update or correction to our information about Nolah? If so, please take a moment to suggest an edit. Nolah mattresses sold by Nolah come with a 120-night in-home trial. If not 100% satisfied, Nolah will arrange a FREE pick-up return and refund you in FULL. Nolah mattresses are only available online.